Learn the age old technique of egg blowing and then instead of just painting the blown egg, make it in to a fantastic looking dragon’s egg in a few minutes with a bit of hot melt glue gun glue and some paint. That’s it, it couldn’t really be simpler than that! When you’ve done, why not have a look at dadcando, where you’ll find free downloadable printables for an Egg Stand and Antique Egg Mailing box. 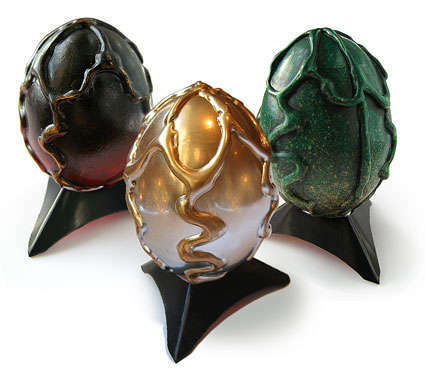 It’s a great project for Easter, or any other time of year when Dragon Eggs are in season. First of course you have to buy your egg (or raid the fridge). I used large hen’s eggs for this project (keeping it easy), but you could use duck, goose or even ostrich if you are feeling really adventurous. The beauty of the hen’s egg is that the glue gun hotmelt really works at this scale. If you go up in size, then you have to be prepared to do a lot more work to get the egg to look right. Please use free range if you can… help chickens have a better life. Don’t worry about the waste, There doesn’t have to be any. Once you have blown the eggs, you can always make scramble or an omelet from the contents of the egg. So, first off, wash the egg quickly in cold, slightly soapy water. In a minute you are going to be putting your lips to that egg surface and you know the last place that egg was !! Now, to making the hole; strangely, this is not as easy as it sounds. For those of you with Dremmels, or miniature drills, (or dentists even) then this should present no problem, but for mere mortals, the egg is surprisingly hard, and being… well, an egg shell, is also quite brittle. To make the hole you get a very sharp craft knife. Put the point of the tip of the blade against the tip of the egg at one end and turn back and forth about 180 degrees each turn. You’ll find it seems to take ages to get started. Don’t be tempted to push to hard or you will break the egg. If you feel that you are not getting started, then carefully scratch a cross at the end and put the tip of the blade at the centre of the cross and go back to turning it back and forth. Once you break through the going gets easier, but you still have to take care as the blade can bite in and chip or crack the egg. If you are patient (only 5 minutes or so of turning) then within a few minutes you will have a hole about the size of a drinking straw. In fact you are aiming for a hole, the diameter of anything between a cocktail stick and drinking straw. Don’t worry if you do chip a little bit away, you will be covering that up with hotmelt in due course. Make a hole like this IN BOTH ENDS. Now it’s time to put your lips where for along while the sun did not shine (in the chicken world that is) and blow. The trick is to blow hard (depending on the size of the hole) while holding the egg gently, this can be tricky. It might also help to poke a cocktail stick into the egg first and wiggle it about a bit so as to break the yolk sack, because that is one tough thing to blow out of a small hole. The whole blowing part is a good job to get the kids to do (a bit of at least), anything from about 8 -9 years old or onwards should be fine. Collect the white and yolk in a suitable bowl or jug, and save for later conversion into scramble or an omelet (probably best if you do this the same day and once you have blown all over the egg yolk and white, I’m not sure how long it will keep). Also (not to be gross, but) all that blow / spittle that you might have got into the mix as a byproduct of all that blowing, might preclude the serving of said scramble to guests outside the immediate family! Once all the egg white and yolk is (rather cathartically) evacuated, run the egg under the cold tap to clean out the inside as much as possible. If you can, it might be worth filling your mouth with water and blowing that through the egg. You don’t want it getting smelly. I have to say that I have never had an egg prepared like this go bad. As with many model making projects, the problem of how to hold the work piece while you paint it, work on it, and other wise tinker with it, is overcome by attaching a small sacrificial handle. The dragon’s egg is no different. Put some hot melt on the end of a cocktail stick and gently push it into the egg at one end so that most of it sticks out. Hold it till it is set and add a little bit of hot melt, glue gun glue on the outside if necessary. You must still handle the egg with care, but this simple handle will make all the difference. If you were making a regular painted egg, at this point, you would just start painting. However, this is Instructables and this is an Instructable on to make a Dragon’s Egg. So, instead of painting the egg right away, draw some features on it with the hot melt glue gun. Of course you can do any pattern you like. In fact variety and invention is the key to making your dragon’s egg a real original. (As you can see one of the comments is that you could also make an Alien’s Egg, now how cool would that be… mmm might try that ). But in case you want to practice before you branch out, here’s how I did it. First: I drew loops round the upper half of the egg, while rotating it. Third: I joined the bottom of each of the loops to the bottom tip of the egg (right by the cocktail stick) with wavy lines. It is now a Dragon’s Egg and you must spray it or otherwise colour it appropriately. I have a number of old cans of spray paint and so I chose black (with a red glow at the bottom), half and half gold and silver, and a really rich green. You could try almost any colour. I believe that Dragon’s Eggs of almost any real colour have been described and I’m sure there are a few out there with imaginary colours! Now you should really distress your Dragon’s Egg a bit. After all Dragon’s Eggs have been known to be 1000’s of years old. Like all distressing, all you have to do is paint a bit of grime on and wipe it off so that it goes in all the crevices, which of course you have just made using the glue gun. Paint on black acrylic paint (or other contrasting colour) and then while it is still wet, wipe it off. This is an optional step. however, adding those last few details is great fun and does make the Dragon’s Egg look really special. I used gold rubbing paste (Rub n Buff (US), Gold Finger (UK)) but you could use a bit of contrasting paint on the finger tip or a luminous gel pen, for example. Carefully cut off the cocktail stick as close as possible to the base. Either use a strong pair of kitchen scissors or better still a pair of wire cutters (blades meet rather than shear). Do not rest the Dragon’s Egg on anything and use force that could translate to the Dragon’s Egg itself, when cutting off the stick. If you want you could place the cocktail stick in a vice and hacksaw it through carefully. To make a stand for it paint a bottle cap black, cut down a 35mm film tub (to about half an inch (1cm) should do it), or go to the dadcando egg stand project, and get the free downloadable template to make a really nice stand that has been specially designed for this egg. Whilst you’re at it why not have a look at the Antique Mailing Box, which you can make to keep your Dragon’s Egg safe, and pretend that you got it from a far off land. Whatever you do, have fun making this project. I think it will make the most original and exciting Easter gift for someone dear.